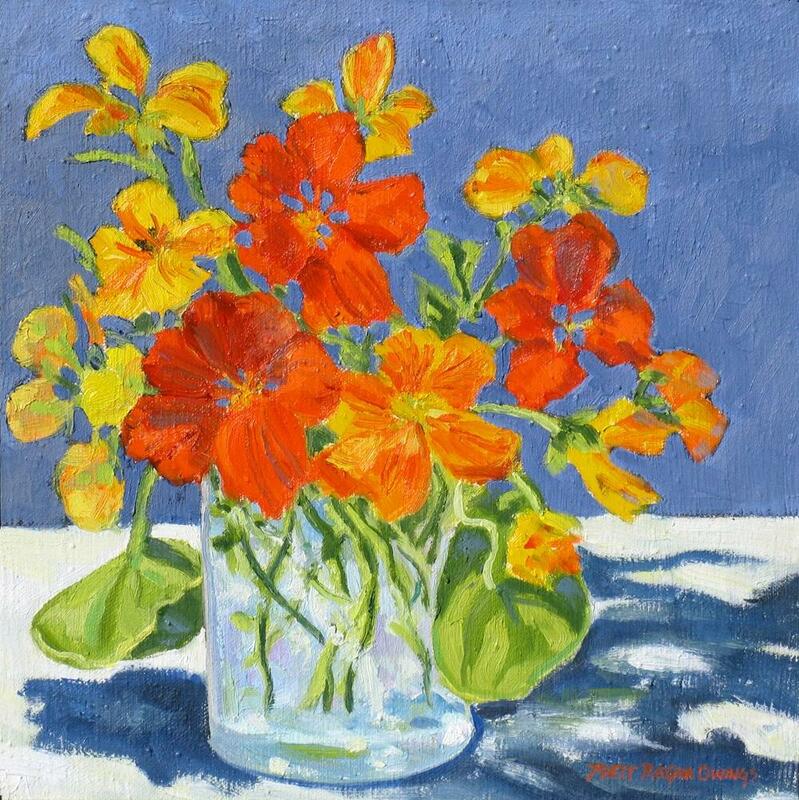 To enter to win Rhett's painting, "Nasturtiums" go to Daily Paintworks and click on the link at the top of the page announcing their interview. My 2nd grade teacher gave us some finger paints to play with. I loved getting my hands and even my arms into that paint to play! I guess I must have made an impression, because the 3rd grade teacher in the next classroom saw my paintings and invited me to come to her class and show her students how to do it! 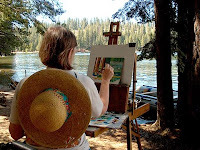 That was my earliest memory of painting… and teaching art! Later in High School, I took Art every year and was the President of the Art Club. I won the Bank of America Award for Art and that was very encouraging. I majored in Art in college, earning a teaching credential. Teaching Art at the junior high school level for thirty-two years consumed my life after that. Teaching rarely gave me time to create much art for my own pleasure and it wasn't until I retired in 1999 that I really dove into painting full time. I took a series of art workshops and lessons from well known artists and have been enjoying painting seriously ever since. Enter to win by clicking on the link at the top of the DPW home page announcing Rhett's interview. The biggest stop in my art career was the passing of my parents. They were collectors of antiques and amassed eighty-seven years worth of stuff. I have been spending eight years trying to find homes for all the things they collected. I am still dealing with it! 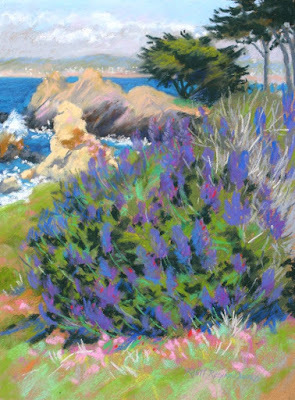 I have been working in pastels since high school, but experimented with acrylics, watercolors and oils. The last eighteen years or so, oils have been my main medium as I enjoy painting "en plain air" on location. It is difficult to bring pastels on location, but I have done it. I worked in water colors for awhile, but truly oils are my favorite medium. 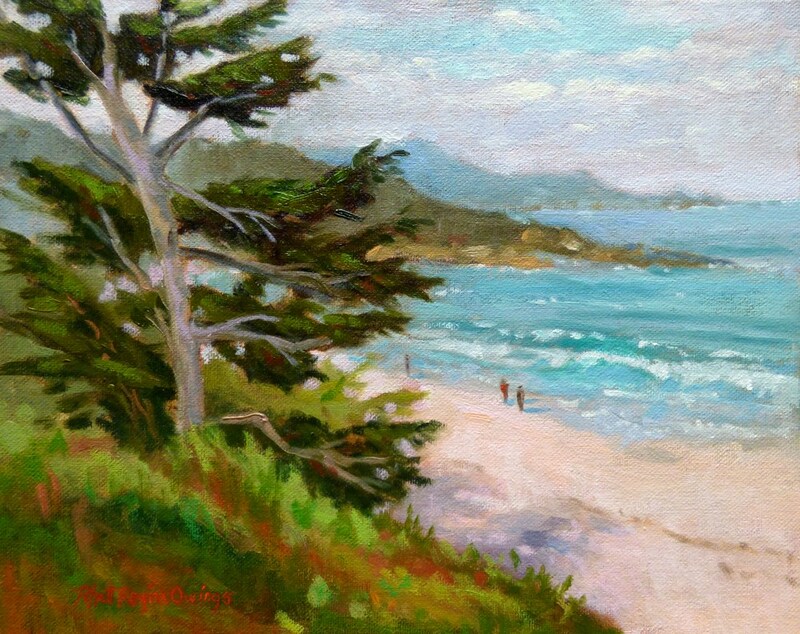 Water based oils have really captured my attention now as they are so much safer and I love them. I have also been experimenting with just pen and ink adding white conté crayons or ink making small ACEO paintings & drawings. The new acrylic inks are fascinating too. And I have invested in the new Pan Pastels which are so interesting. Water based oils are my first choice of media for sure, but I am enjoying re-discovering pastels again after setting them aside for awhile. I find watercolor to be very challenging and I admire other artists who are able to create such beautiful pieces using this media. I do play with it now and then and it is nice to bring on vacation and I also work with them in my car when the weather is bad. I really want to explore acrylics using mixed media techniques. It is fun to play with stencils, sponges, stamps and just plain colors. I just need time to play. I also want to explore using my new Pan Pastels. I have taken some of my old pastel paintings and even old watercolor paintings and added the Pan Pastels on top. They are amazing for adding another dimension. Are there any subjects you find challenging? Roses! I love roses, but I find them so difficult to capture their delicate petals and beauty. I admire Daniel Keys and his amazing flower paintings. Painting landscapes on location is really the best way to see color and I try to do it whenever I can. It is a challenge to figure out how to pick and choose what to add and leave out of a scene and make a good composition. I have invested in all the plein air equipment and am pretty much ready to run to a location to paint with my friends or by myself. The beautiful California coast, our central California farmland, the magnificent Sierra Mountains… they all give me the itch to paint. It is wonderful to be outdoors, feel the breeze, hear the birds sing and watch the waves crash on the beach. I look for color, strong shadow patterns, diagonal lines, ways to lead the viewer into the painting and a way to tell a story with my art. When the weather does not cooperate or I can not leave the house, I love being in my studio. I set up still lifes, pick flowers, look for fun stuff to paint as well as search through my thousands of photos for inspiration. Carol Marine's book: Daily Painting has been a game changer for me. I love painting small and often. I just finished reading Lust for Life about Vincent van Gogh. What an inspiring artist he was! He had many problems, but he was truly an amazing artist. His passion for painting makes me want to continue struggling with my own painting. I also admire the work of Monet, many contemporary artists and other DPW artists. 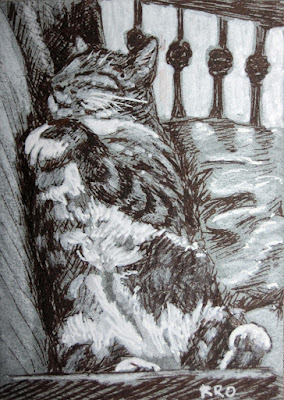 I try to get my housework and other chores done first so I can spend time in my studio. It is amazing how life gets in the way when I want to paint. I love going to art museums and art galleries. There is nothing like seeing art in person. I also enjoy taking workshops from other artists, watching videos and checking Pinterest for ideas. Being with other artists and painting together helps keeping me going and there is nothing like selling a piece to inspire me to keep trying. I have been enjoying working in a series. 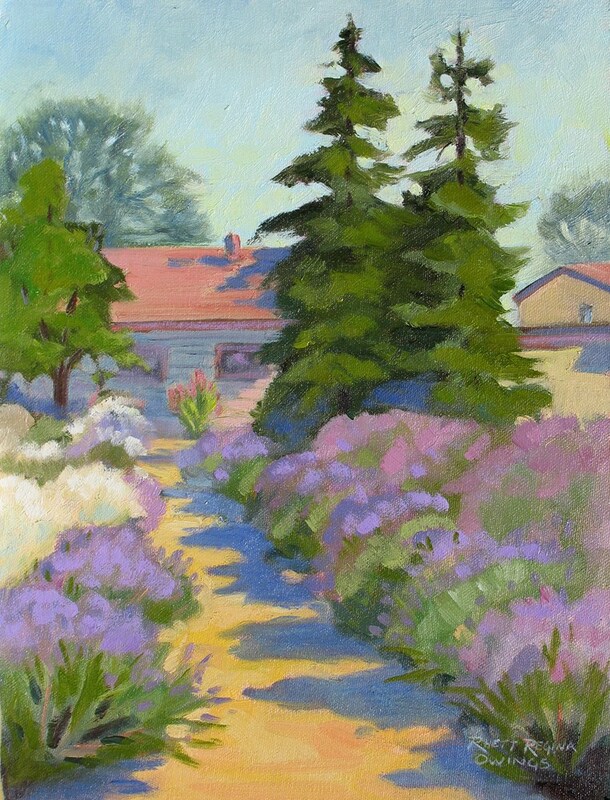 I find painting the same subject over and over in various ways and angles improves my skills and inspires creativity. I have not painted many figures in my work so I am practicing ways to add them as well as birds to my paintings. I am also working on making my brushwork more loose and light. I also am trying find ways to add more atmosphere to my landscapes. I love the DVDs of New Zealand artist Richard Robinson. He is such a good teacher and I have learned so much from him. There is nothing that gives me that happy dance feeling more than selling a painting! It is like getting a blue ribbon! It says someone out there likes my work enough to pay money for it! It says all my hard work has paid off and someone out there is now enjoying my work and I can move on to new and greater things! When I am painting, I am in another world and all the cares of the world float away. I am in a world where I am solving problems and making decisions. What color does that need? How do I make this or that work? Does your eye go into the painting and move around? Does it speak to someone or bring them fond memories? What is the best way to frame it? And after spending twenty-plus years practicing, does this painting work? What can I do to make it better? I love taking old paintings and re-working them. My style and skill has improved so much and it is fun to see the old painting bloom! I wonder what a painting I do today will look to me in another ten years of practice and how would I improve it then? I am always learning.